Sound and Script in Chinese Diaspora. Cambridge, MA: Harvard University Press, 2010. 370 pages. Chapter 1, “Literary Governance,” establishes the main questions of Tsu’s inquiry into Chinese diasporic cultural expressions. It introduces literary governance as a field produced by material and historical processes that shape linguistic capital between the global and the local as a “polycentric network of precarious literary alliances, limited resources, and shifting linguistic loyalties” (p. 13). I return to this key term in Tsu’s approach after summarizing the remaining chapters. Chapter 2, “Chinese Lessons,” sets the stage for the question of sound and script in diasporic Chinese cultures by revisiting the debates around script reforms at the end of the nineteenth century. It analyzes a wide range of phonetic script models proposed by Wang Zhao, Mok Lai Chi, Lu Zhuangzhuang, Yang Li, Li Wenzhi, and others. 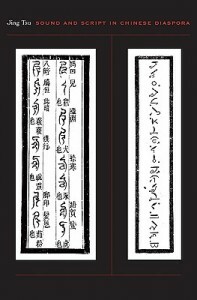 Special emphasis is placed on questions of phonetics, as well as on schemes that compete with linguistic standardization in the interest of national identity and explore how to make “the hand write the mouth” (literally “My hand writes [what] my mouth [utters]”)–to paraphrase a claim by Huang Zunxian [p. 33]). The competing projects under analysis here point to the heterogeneity internal to “Chinese” culture and constitute the modern birth of strife and renegotiation among different Sinophone languages. Chapter 3, “Lin Yutang’s Typewriter,” one of the most insightful and enjoyable chapters of this book, traces the history of the invention of the Chinese typewriter by cosmopolitan intellectual Lin Yutang as an intercultural and transnational endeavor that anticipates the digital globalization of the Chinese written character. At a historical moment in which the importance of media for linguistic, cultural, and political power emerges–visible for instance in Marshall McLuhan’s theories or I. A. Richard’s Basic English–Lin’s invention renegotiates linguistic difference through the machine, attempting to affirm Chinese as a world language with the help of media technology. Chapter 4, “Bilingual Loyalty,” discusses three bilingual writers and their relation to writing in another tongue (in this case English): Lin Yutang, Eileen Chang, and Ha Jin. Although the chapter cannot do justice to the multifaceted works of each of the authors under analysis, it provides an extremely insightful critique of bilingualism. It brackets the ideological mystique of bilingualism–and its concomitant romanticization of liminality and hybridity–and reframes the idea of the bilingual author not only as an uneasy negotiator between different traditions and languages, but as implicated in an impossible process of double translation and inescapable disloyalty. Chapter 5, “Chen Jitong’s ‘World Literature’,” traces the strategic call for a Chinese version of world literature by Chinese cosmopolitan Chen Jitong in France. Given Chen’s political involvement, especially in the declaration of the Republic of Taiwan, this chapter literalizes the republic of letters and underscores the political aspect–or real governance–that is intertwined with literary governance. Chen’s strategic interest in world literature is put into pointed dialogue with the minor role of Chinese literature in Goethe’s scheme of world literature. Chapter 6, “The Missing Script of Taiwan,” returns the reader to questions of script models, but now in the context of Taiwan, with the question of how to “script” the dominant local Sinophone language Taiwanese (Minnan or Hoklo) at its center. Drawing on Cai Peihuo’s work and Song Zelai’s literary experiments with Taiwanese, this chapter presents the attempts at the formation of a Taiwanese script as an intermediary that renegotiates between different major languages and scripts. The conclusion to Sound and Script in Chinese Diaspora works more like a coda than a recapitulation of the intellectual journey on which the book has taken us, sketching possible future avenues for research in and beyond Sinophone studies. Literary governance as a term develops out of the need–addressed by Tsu at key moments of her book–to reposition current debates on interculturality. Rather than aligning itself with prevalent concepts in postcolonial theory, “literary governance” eschews too facile an affiliation with idealized notions of interculturality, epitomized in terms such as “contact zone,” “hybridity,” or “third space.” The term “governance,” which might at first glance smack a bit too much of politics–in a literal, not merely a figurative sense–genuinely serves to redirect our attention to the real stakes of power, often connected to national agendas. Where a position at the margins of or in-between dominant cultural and linguistic traditions might be an enabling space, it is first of all–so Tsu reminds us–a space of insecurity and disempowerment, one that forces those who inhabit it to vie with dominant expressions and make use of limited resources, trying to oust competition and forge precarious alliances in a bid for linguistic and literary prestige. Although “literary governance” echoes strongly with questions of renegotiation or collaboration, the concept frames literary production as a kind of language and culture war, with its skirmishes and strategic alliances. This is an important caveat on Tsu’s part, and yet its necessary attention to the linguistic and political pragmatics of transcultural literary practice seems to elide aesthetic pleasure–even though Sound and Script in Chinese Diaspora itself derives much of its power from superbly told, as well as enlightening, stories about cultural experiments and adventures at the margins of dominant cultural systems. It would indeed be naïve to endow diasporic or minor expression too quickly with the energy to resist hegemony or essentialism, but do the examples that Tsu presents us with–as byproducts or remainders–in the end underpin power structures such as nationalism? Sound and Script in Chinese Diaspora itself contains a suggestive answer to this question, one that could have been brought even more to the surface: the creativity of the diasporic interventions under analysis in Tsu’s book all destabilize the mystique of “linguistic nativity” (i.e., the idea of the “mother tongue” or the “native speaker”) at the heart of national identity politics. Although literary governance as a concept serves important critical work, Tsu’s reflections become particularly insightful whenever the question of the mother tongue becomes the focus of attention. The currency of literary governance–both real and symbolic–is language, and the notion of linguistic nativity is central to the game of literary governance. As Tsu provocatively states: “‘Native speaker’ is to language what color has been to race” (p. 197). Or, reframed slightly, the mother tongue, this embodiment of language in its “natural” state, as innate rather than acquired, remains an important mainstay of essentialism and identity politics, even in an age in which identity has been (theoretically) challenged–or “deconstructed”–in so many ways. The examples in Sound and Script in Chinese Diaspora certainly showcase the renegotiation of linguistic, cultural, and political capital, but, more important, they throw the problematic, paradoxical notion of linguistic nativity and its ideological potential into high relief. They reveal the fact that in obeying economies of access and communication, linguistic nativity cannot be reduced to an identity or an essence. In several instances, Tsu unveils how the notion of the mother tongue becomes a tool of disempowerment rather than empowerment; or how, under specific and very real cultural and political strictures, one’s mother tongue might feel uncanny, strange, or out of reach. In other words, these examples showcase the problematic nature of the concept, even as they also try to use, with varying outcomes, its symbolic capital. The mystique of the mother tongue works on two levels. As an essentialist notion of identity, the idea of a given, natural language cements national ideology. It also acts as a screen to cover the fact that a national language is nothing but a highly constructed product, incessantly policed, standardized, and cleansed. On a second level, the mystique of linguistic nativity still constitutes a valuable currency in the humanities, in the figure of the native informant–or her more postmodern avatar, the hybrid, bilingual subject. As such it is a mechanism that restricts rather than allows access, by validating the expertise of certain native speakers only in a tightly controlled and limited field of knowledge. Instead, Tsu argues for a view of language as “medium of access rather than as a right to identity,” as “a currency instead of a stamp of authenticity” (p. 13). If you are interested in comparative literary studies, Chinese culture, and theories of interculturality–or if you are simply looking for an intellectually challenging, yet enjoyable reading experience–make sure to read this book. Its narrative eloquence, its thorough contextualization, its amazing erudition, and its critical insights will speak for themselves.